Are you attracting the right applicants? 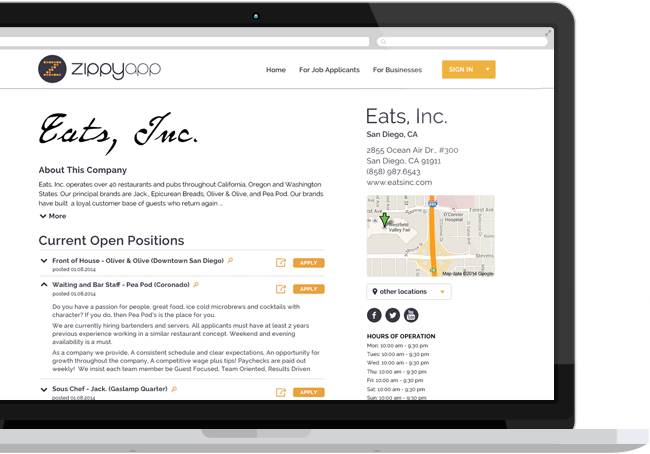 ZippyApp brings your hiring campaign to the people who already love your business, the people who come through your doors every day. And our mobile application makes it quick and easy for anyone with a mobile device to scan a QR code and apply for your jobs on the spot, anytime, anywhere. With ZippyApp, it's easy to manage multiple business locations and positions, and the applications you receive for each one. Customize each job posting to get the information you need to make informed hiring decisions. Then easily track and review applicants and automatically notify applicants when a position is filled. 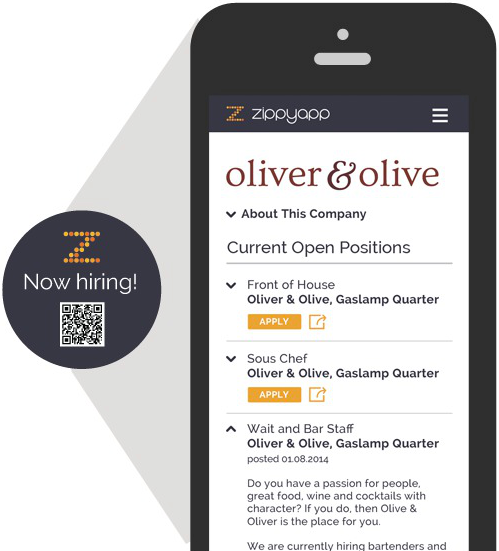 ZippyApp makes the hiring process easy for you and for your job applicants. 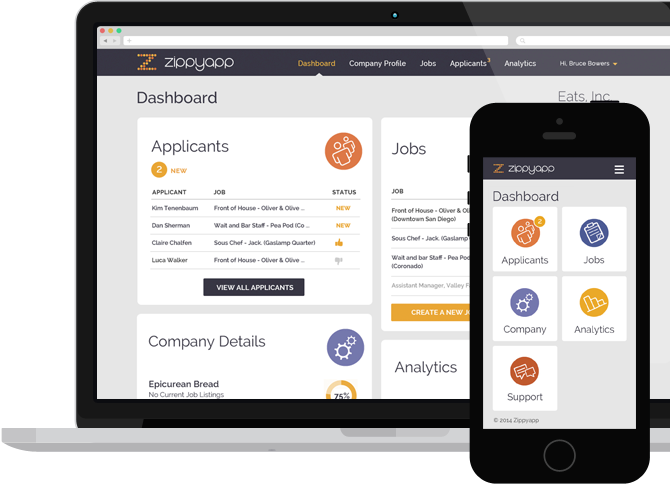 Intuitive and elegant, ZippyApp allows you to create a custom database of positions and applicants. Request specific information for each of your open positions without any programming or software to install. Attract the perfect applicant for every position with a hiring page branded and personalized for your company. Let ZippyApp change the way you hire. manage your hiring needs. All plans include these great benefits. While all of your business locations have custom hiring pages with their own distinct URLs, they can be simply managed from one account. Hiring signs include a unique QR code for applicants to scan with their mobile device and easily submit their application. Any Device, anywhere, anytime. Our innovative, self-learning algorithms improve with usage--enabling us to match the perfect applicant to your job, significantly reducing application processing time. Manage all of your applicants in one place with the ability to rate, tag, sort, filter and save them for future hiring needs. Your applicants can indicate their availability and set their status as On-Call, making it easy to find applicants for your last-minute hiring needs. We are continually improving our SEO techniques so that job postings and hiring pages are found with ease. There is never a limit on how many applications you can receive. We encourage applicants to submit their completed profiles. Let our matching engine do the work! We are a Software-as-a-Service (SaaS) offering, managing everything on our end. You'll always be running the latest and greatest. No hassles! We offer multiple levels of service to best address the hiring needs. When you set up your account, you'll chose the right plan for each business or location, not one for all. Contact Us for Enterprise wide pricing. Sign up for ZippyApp today! payroll system, applicant tracking system, or other existing infrastructure.